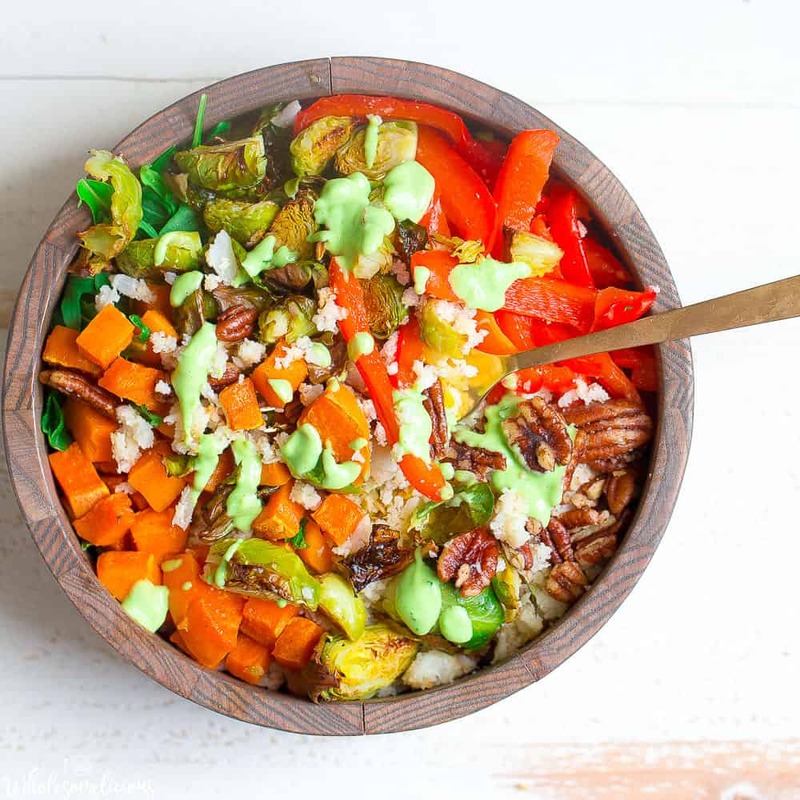 This vibrant bowl is filled with roasted veggies, cauliflower rice, and topped with the most delicious avocado cilantro sauce! 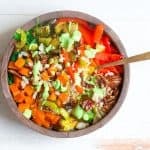 You’ll love this Buddha Bowl as a healthy lunch or side dish that is grain-free, gluten-free, Paleo, Whole30, and Vegan. All made on a single sheet pan! Oh HEYYYYYY March!! How did this happen already?!?! Some of you know how much I love winter, it’s my favorite. I love the slow pace, warm fires, cold weather and warm coats, snow days, and the coziness. What’s not my favorite? The produce. So as much as I look don’t necessarily love to say good-bye to winter, I love saying HELLO to the fresh tastes of spring, and especially love that the vegetables just taste better. There’s no denying that. So in an effort to ring in the season with a bang, let’s do a veggie bowl. I think you guys are going to love this one. 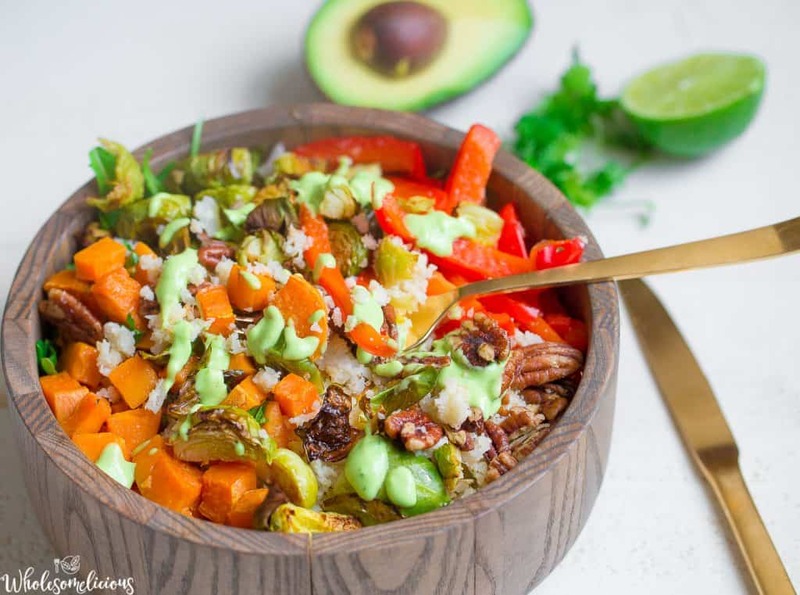 I have always loved the idea of a Buddha Bowl, an overstuffed bowl filled with nutrient dense foods that resemble Buddha’s belly. 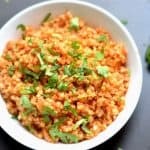 Most of them have a grain base, so I’ve changed it up a bit here using a base with my new favorite way to enjoy cauliflower rice: roasted!!! Bell pepper, brussels sprouts, and sweet potatoes are also roasted on the same sheet pan to make things easy peasy. This mama needs easy. The result is pure yumminess. But let’s not stop there. 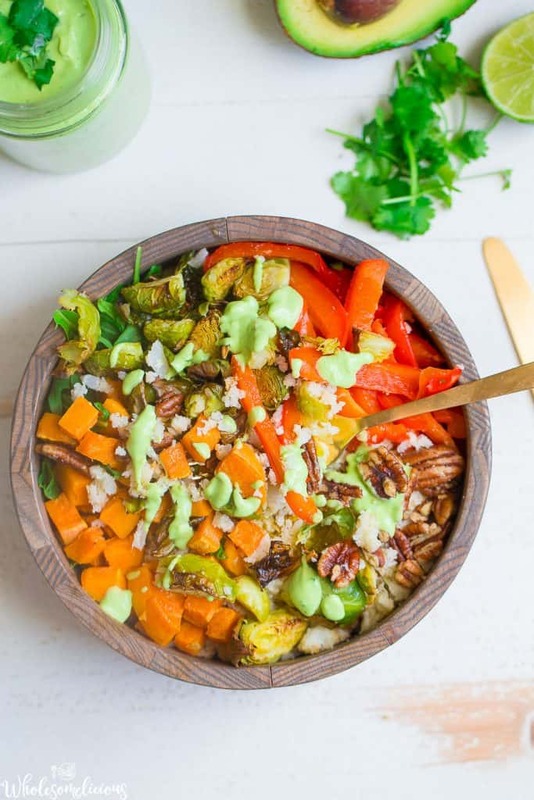 Let’s mix in a ridiculously yummy avocado cilantro sauce, and some nuts for more texture and crunch. It’s the perfect lunch. And if you want to add in some additional protein, feel free. 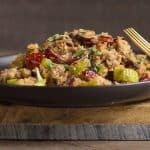 Want to change up the veggies a bit? Go for it. Change the nuts? I suggest pepitas or pumpkin seeds. And more cilantro is always a good idea! Begin by preheating your oven to 425. Lightly grease a large baking sheet and set aside. 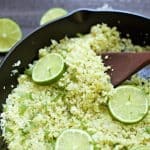 Make your cauliflower rice by cutting cauliflower into florets. 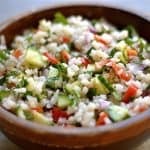 Place inside your blender and pulse for just a few seconds until it resembles a rice texture. Do not over pulse or it will become mushy. 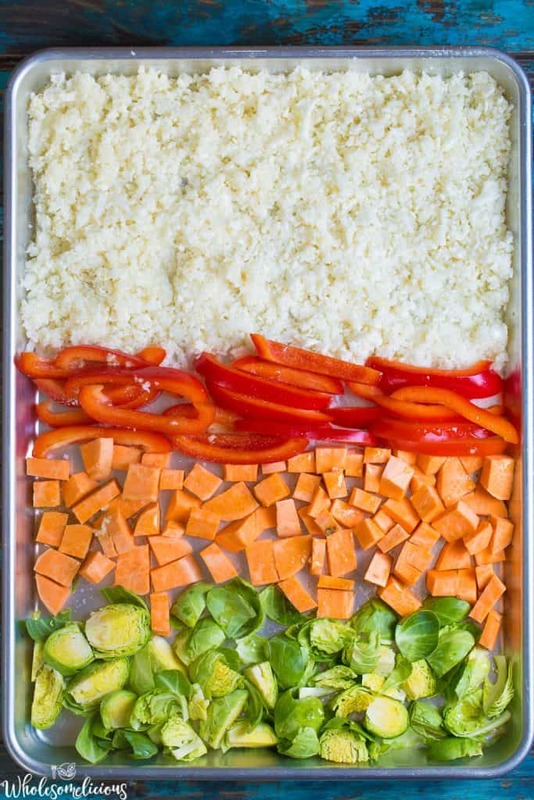 Arrange in an even layer on half of the pan, saving room for the other vegetables. Arrange the rest of the vegetables on your pan. Coat with oil and season with salt and pepper. Place the baking sheet in the oven in the middle rack position. Bake for 22-25 minutes, or until the vegetables are golden and roasted. While vegetables are roasting, make your sauce. Add avocado, garlic, vinegar, cumin, lime juice, water, cilantro, pepitas, and salt in the blender. While blending, slowly add oil. Continue to blend until smooth, adding a bit more water if the dressing is too thick. Serve the bowl with rice on bottom, then top with veggies. Add in pecans, season with salt and pepper, and top with avocado cilantro sauce. *You can replace the pecans with a nut of choice like almonds or pumpkin seeds. This was such a delicious recipe. 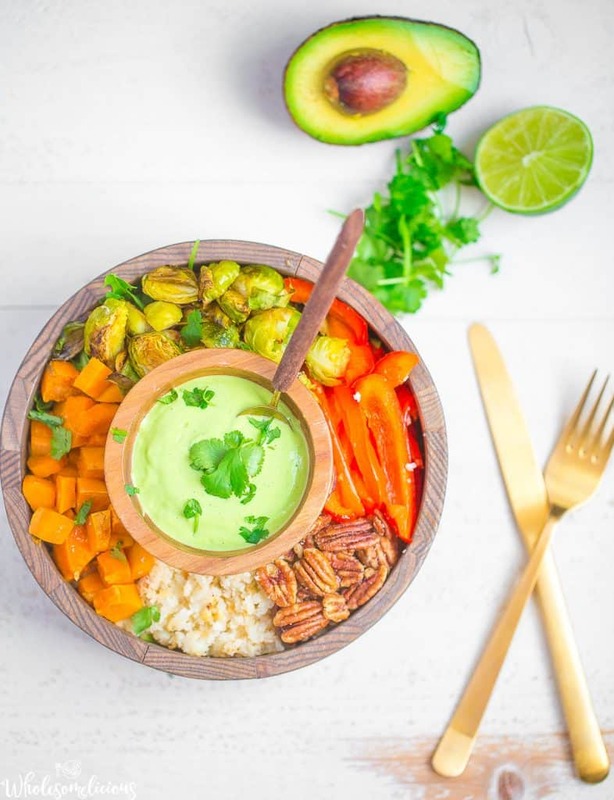 I absolutely loved the earthiness of the roasted veggies, the crunch of the pecans and the garlic, cilantro goodness of the avocado cilantro sauce. That sauce will be a staple for sure! I didn’t have pumpkin seeds for the sauce so I subbed in cashews and I only used 1/4 of the avocado oil! So amazing! Thank you for another spectacular recipe.